Selling your business is a time and thought consuming process. Before you’ve even entered into official negotiations or due diligence, you’ve likely spent weeks (or months) discussing the prospect and its consequences. Even for the most experienced business mind, selling can feel like a difficult and challenging time, both emotionally and strategically. Because of this, it’s important to ensure you’ve considered the decision, and the offer, from all angles. Question 1: Do you have a walk-away number? Technically, you have two walk-away numbers. The first is a number so low, you stop and walk-away from negotiations. The second, is a number in the right price-range that makes you walk-away from your business (resulting in a successful sale). Think about what these two amounts are, and what offer would truly make a decision for you, either way. Your buyer will likely have their own ‘walk-away’ numbers, and the key here is finding the middle ground where you can both feel like you’ve got a good deal. It’s important to outline these numbers early on, as it’s easy for these large numbers to become abstract when discussions are lengthy and negotiations are intense. It also ensures you won’t take an undervalued deal because of negotiation pressure or time constraints. Question 2: Are you willing to balance cash and shares? Not all business sales are straightforward cash deals, and many include a balance between cash and shares. It’s important to know how you feel about these different options before entering the negotiation, as it can hugely affect the amount of money you walk away with. If shares are on the table, take time to research their potential value, and look into any previous stock market fluctuations. It’s also key to investigate which stock market the company is registered with (and if they’re registered with any at all). The London Stock Exchange, the New York Stock Exchange and the NASDAQ stock exchange are the ones you’ve most likely heard of, but there are also smaller stock exchanges such as AIM, Euronext and NASDAQ Nordic. The stock exchange that your shares are registered with can affect the price and value, so it’s important to do your research. It’s also key, if being offered shares, to understand how those shares are structured, and when they can be sold. Most companies will have regulations or agreements in place regarding their shares, so you’ll want to have as much transparency here as possible. Question 3: Is the payout time scale right for you? If your buyer is suggesting a staggered payment, it’s crucial to understand the structure of this, and the time scale too. For many business sales, the founder or owner may be expected to stay with the company as an employee for a set period after the sale completes. It may only be after this period that the final payments can be made. These final payments (referred to as an ‘earn out’) are often dependent on the performance of the business during a period under the new owner’s control. Think about how much control you’ll have over how the business will be managed during this time, and how much impact you can have on its performance. Question 4: Are you happy with how the negotiation is being handled? This is something to consider on a personal level, as your experience with the buyer is a heavy indicator to how they are to work with or work alongside. If you’ve found negotiations difficult and unpleasant, it may be a sign that your working cultures aren’t a good match. This is especially important to consider if you’re planning to remain at the company once it has sold, as part of an earn-out period. 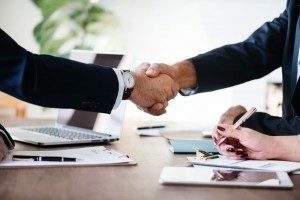 If you’ve found the negotiation period unpleasant and you’ve been left feeling negative towards the buyer – it says a lot about how the working relationship could continue. Even if you’re not planning to stay, your staff will be, so you might want to make sure they’ll be in safe hands! Question 5: Is this really what you want? Many business owners find themselves carried away in the negotiation stage of selling, and don’t take time to consider what they want and how it could affect their life going forwards. Before signing on any dotted line, ensure you’re comfortable with the decision and excited about the future.